Do you love hosting a big Thanksgiving dinner, or does it stress you out? Some people host huge gatherings of family and friends because they love to do it. They love the chaos and the warmth and the togetherness. And some people host out of a sense of duty, or “you hosted last year, so I’ll do it this time,” or because they’re the only one with enough chairs. Either situation can result in a fantastic gathering, with a little planning like a pro. Identify your stressors and get rid of them. As a caterer, I know lots of little shortcuts to make an event go more smoothly, but the truth of the matter is that if the host or hostess is stressed out, it will be a stressful event! So first and foremost, do everything you can to eliminate the stress from your event—whether that means shutting everyone out of the kitchen and doing it all yourself, or turning the cooking over to a professional. Identify the parts of the day that stress you out the most and think of ways to delegate. Love making sides, but stress about the turkey? Why not order a smoked bird that just needs reheating. Or maybe you’re a turkey pro, but pie crust sends you reeling? Order a pie from your favorite local bakery (just get your order in early). 1. Read through all your recipes carefully. Decide what to cook and in what order; some things might be able to share the oven while others might not.Do as much as you can before the big day. Many desserts, sauces, and appetizers can be made ahead of time. Chop up vegetables and herbs, cut bread for stuffing, grate cheese, and even pre-measure spices ahead of time to make cooking go more smoothly. Don’t forget to thaw the turkey! 2. Delegate! When people offer to bring something, take them up on it. Be specific about what they can bring or how they can help. 3. Have drinks and nibbles ready to go when guests arrive—to keep them out of the kitchen and out of your hair. Mix up a pitcher of cocktails or punch, or assign someone to be the bartender to keep you free. If your family aren’t big drinkers, even a festive drink like warm apple cider will be welcome. 4. Set the table the night before. 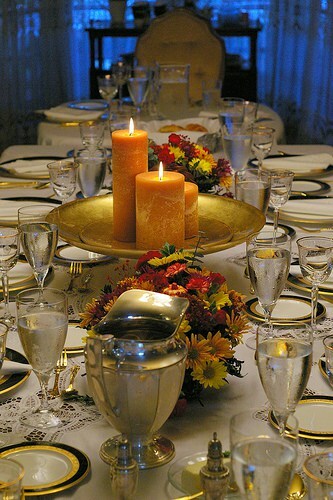 Keep centerpieces low and simple so people can see around them, and use unscented candles. 5. Set dishes out buffet-style near the table and allow guests to help themselves. You can make simple handwritten signs to identify dishes or even print menu cards listing ingredients if any of your guests has food intolerances. 6. Don’t try to carve the turkey at the table. Do it in the privacy of your kitchen with fewer prying eyes and less pressure! 7. Keep extra rolls, gravy, or other dishes warm in the kitchen in case you need to bring out extras. 8. Put pitchers of water and other beverages with the food to make refilling drinks easy. 9. Have containers on hand for sending guests home with leftovers. Chinese take-out containers can be a fun alternative to tupperware! 10. And, most of all, do whatever you need to do to ensure that you have time to enjoy the day as much as your guests. What are your best tips for a calm and easy Thanksgiving dinner? Share your wisdom in the comments below.